The contents of this page for Trick Training is still under construction. Please check back. Well, first you need a small hoop. Some of the animals I have taught this trick are a Guinea Pig and a Hairless Rat, so my hoop needed to be about 6" -10" in diameter. Remember the old Jarts game? Now one of those hoops would be perfect, if too large you can take them apart and trim them down. Use a hoop according to the size of your pet. Other ideas would be an embroidery hoop, the outer rim of an ice cream tub top, a bucket cut apart and covered with fabric, a (thin) wreath, a tennis racket minus the string.....there are many possibilities, just make sure that there are no sharp edges and if you will have an audience cover the hoop to make it attractive with pretty duct tape (it now comes in many colors) or fabric. I bought an 8" wooden embroidery hoop at a Thrift Shop for .10. Watch Garages Sales too. 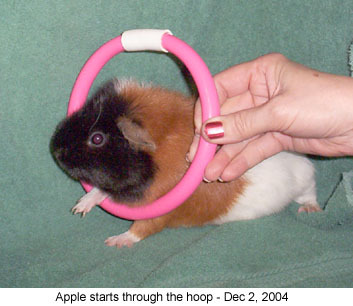 To teach Jumping Through a Hoop, hold the hoop in front of the animal, who calm and is in a safe place, you are holding the hoop so that it touches the ground or bottom of the cage. Call the animal's name while holding a treat in your other hand on the far side of the hoop to entice the animal to step forward to receive the treat. Here is where you might need three hands . If the animal does not come forward, or if it moves away from the hoop, give the animal a cupped hand nudge, or easy push, thru the hoop....MAKE A BIG DEAL.....not screaming of course, this would scare the animal. Treat the animal, this is where clicker trainers would click the clicker. Now, repeat this step over and over until the animal comes thru the hoop on it's own and is happy doing it. After the animal is comfortable coming thru the hoop on it's own, lift the hoop up just a bit. Each time the animal has completed the task, treat, click or whatever you do to let the animal know it has done what it was asked to do and it has pleased you. Now, you can start raising the hoop more and more (keeping it within reason per the species) but remember Guinea Pigs are only going to (or should) jump the hoop at about an inch. Now a Rat could jump the hoop at 6", Hamster, well, let's just say if you get your hamster to do this be happy with the hoop touching the ground...you have done well. Please let us know how your training is going with your animals and where you found your props. We can all share and have better animal relationships because of it. id= 337 align=rightWant a cute trick to teach your pet rabbit? Do you have a child's toy piano? If not, check Garage Sales and Resale Shops (I have bought several for $0.25 - $5) I think a large rabbit could play a small piano with a bit of slow going training. This is an EASY trick to teach a dog, but will take more time training a rabbit. First you would start by just holding the rabbit and having the piano just in front of you. With a sliver of carrot, hit a piano key and treat the rabbit.....over and over and over again. Now, when I say over and over I do not mean all in one sitting, but over several days and with some animals weeks, longer with other animals. Set the rabbit in front of the piano (now this piano needs to be below the rabbits eye level, so buy your toy piano according to your animal's size). Say "Shake, Play Piano" and as you say it take the rabbits paw, as before, then set it gently but firmly enough to hit a piano key.....treat the animal right away. As the trick progresses, say only "Play Piano". Use the word "Shake" just to shake hands . Practice, Practice, Practice. Good Luck and above all have fun......I hope it goes without saying that anytime you are in a bad mood or if you start to get frustrated with any animal during training STOP and put the animal away for the day. Come back when you are in an "up" mood. First you are going to need a belly bag for your rat. You will not want to use the same one that your "purse items" are in because there is a good chance that the rat will pee and/or poop in their bag or get nosy and chew your things. If you use a "used" belly bag make sure that there are no holes in it. Also make sure that you wash and hang to dry a used belly bag so that it is fresh smelling for the rat. If there was candy or gum in the bag and the bag smelled like candy or gum, the rat may chew on the used bag. The trick to this training is to start your rat off in the belly bag while you are watching television or at the computer and can pay attention to what the rat is doing. Put a small treat in the bag and add the rat...DO NOT close the zipper all the way. Rat tails often get caught in zippers and your rat will feel more secure if they are not "shut in". Leave the rat in the belly bag for longer and longer each section you work with your rat on this trick. Be sure to talk to and pet the rat while it is in the bag. After your rat is comfortable in the bag while you are sitting, start walking around the house for short walks, then later in other sections lengthen your walks around the house. It won't be long and you will be sneaking your pet rat out in public with you as you grin because no one knows the rat is even there. 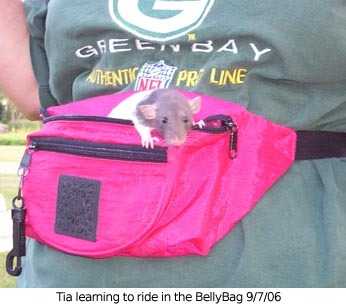 Just be sure you always are aware of what the rat is doing at all times while riding in a belly bag. Check the bag often to see if the rat has been doing any chewing on the bag. If the bag is chewed or torn repair, sew or replace the bag before the next time that your rat will be riding in the belly bag. The rattie in this photo is Tia. I called her my rattie ambassador. She would go many places with us and sit on my shoulder with a little outfit on. I have long hair, so when people saw her, with her Dumbo Ears and no tail showing, they would ask what "it was". By the time I said a rat she, in all her cuteness had sucked the "Yikes!! She has a rat on her shoulder" right out of them. She converted many people to pet rats. 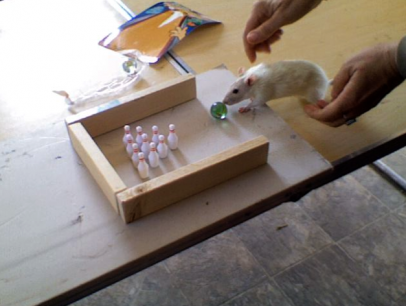 There are several ways to teach a rat to push a bowling ball towards a set of ten pins. It is a good idea to have an "alley" set up for your rattie. An alley can be slanted a bit if you like, but does not need to be. A flat surface will work just fine. On your little rattie alley you might want to have side and back boards. That way your bowling pins will not fall everywhere. Set up your bowling pins, rat sized of course, as you would see them set up for humans in a bowling alley ready for the ball to come down the lane and knock them down. Or set up as you see in this photo. Now, as I said, there are several ways to teach this to your rattie. Probably the easiest way is to set a treat next to the ball, or wipe a treat on the bowling ball. Show the treat to the rattie and give a command...you could use "push", "play", whatever one or two word cue you would like to give. Be sure to praise your rattie when it touches the ball, even if the ball does not move. If the ball does not move, repeat the cue word and move the rattie close to the ball. Most ratties will want follow the ball down the alley, you need to train them to stay and let the ball go. Hold the rattie back as the ball rolls. Come see our funny YouTube Video of Nineveh's first go at Bowling. It was the first time she ever bowling. The first question I always get is "Where did you get the Bowling Pins and Bowling Ball?". I sell them here at our sites under RAT ITEMS - ACCESSORIES. The Bowling Ally? It is a level board with 1" x 2" piece of boards sanded and not screwed together, just setting there. FOR MORE INFORMATION ON TRAINING YOUR SMALL PETS CHECK OUR INDIVIDUAL SISTER SITES.